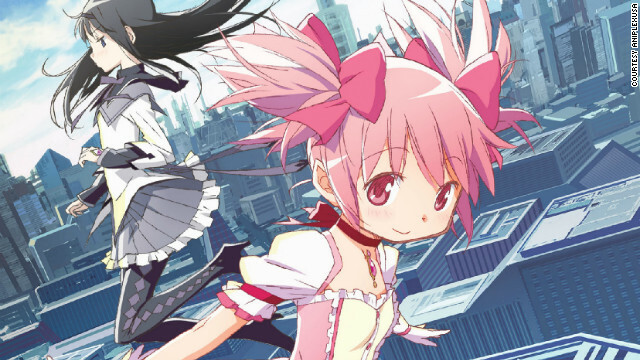 Madoka Kaname, right, and Homura Akemi, left, are two of the central characters of the anime "Madoka Magica." If there's anything that anime fans love to do, it's to argue about anime. Merely proving the point, Japanese website biglobe recently published a top 50 list of the most overrated anime series of all time. The results were culled from a poll of 33,000 votes. While beloved titles like "Neon Genesis Evangelion," "Bleach" and "Naruto" made the list, as expected, they did not rank in the top 10. The No. 1 slot was held by "Madoka Magica," a 2011 series about a "magical girl" named Madoka Kaname who makes a trade with a spirit to become a magic user in exchange for the granting of a single wish. The show spawned multiple spinoffs, including several mangas, two video games and a novel, and was licensed for the U.S. market by anime distributors Aniplex USA. Other titles in the top 10 included "K-On," "Bakemonogatari," "Fate/Zero," and "Angel Beats." American sites such as Crunchyroll posting about the top 50 list saw commenters arguing the selections fervently. It brings up the question: What qualifies an anime as overrated, anyway? Otaku USA editor-in-chief and author Patrick Macias thinks there's no such thing. "Personally, I don’t think there’s any such thing as overrated anime, anime guilty pleasures, or any other such subjective and generalized categories worth taking seriously," Macias said. "This, however, is just my personal opinion." discussing them is an essential pastime of anime community the world over." The anime fan community is passionately driven by discussion, and websites like 2chan and 4chan have long been popular landing pads for people to talk about the best shows, the worst shows, and why they watch them. These communities are also well known for starting threads about popular shows during their actual airtime in order to conduct live discussions of each episode. So why is a series like "Madoka Magica" so popular that even fervent fans are tired of talking about it? "Madoka Magica captured me by telling a very well executed character drama carved out of a very basic genre shell, " says Elliot Trinidad, cosplay photographer and video game designer. "It's true that other anime/media have asked the same questions - essentially: What if being a world-saving hero was more curse than blessing? - but animation studio SHAFT did it with an incredible polish. As you watch episode by episode, rewarding mysteries will draw in the dedicated viewer. Encrypted alphabets, references to Goethe's Faust, even Buddhist themes of the cycles of suffering; all speculated & dissected by an audience hungry for more challenging anime. It is to both the producers' and fans' credit that Madoka Magica has built up such a rich world of mystery and fantasy out of 12 little episodes." "But, like anything that asks viewers to dedicate and invest, it's pretty easy for outsiders to take Madoka Magica at face value: as a hyped up merchandise train, hailed by a loud fanbase, for an anime trying 'too hard' to be dark & different." Trinidad believes that the brightly colored magical girl candy coating actually cloaks a much deeper show, which in turn has given fans reason to clamor and analyze it down to the detail. "The commercialized first-impression you get from the Madoka Magica girls is just as much a deliberate commentary on that kind of commercialization in the first place. The characters' interactions, and the choices they have to make, are unexpectedly deep for the color-coded teenage heroes that anime fans are used to." Obviously, some fans are over it, regardless of the depth it may possess or the appeal it may present to others. If a fan falls in love with a show that is less critically acclaimed but just as good, they may feel slighted that those don't make it into the spotlight and instead the market is glutted with girls in pastel costumes brandishing wands. "I think it’s just a backlash to the shows that have been dominating fandom for the last few years, " Patrick Macias says of the fan reaction. "If you walk into any anime shop in Japan, these will be the shows crowding out all the others for space. People either want to see their personal favorites represented or (hopefully) find something new that appeals to them." Regardless of what's currently popular in the Japanese anime market or what's deemed overrated, one thing is for sure: The fans are still talking. Do you feel highly popular anime is overrated? If so, which ones, and why do you think they don't deserve the spotlight? Anime is not overrated. Once it starts winning Academy Awards, then it will be overrated. Spirited Away won several years back. And on a side note, Spirited Away was not overrated. It was a very awesomely weird and yet entertaining story. I honestly thought I was going to hate it especially since the main character was a little girl. Buck: "and i hate little girls." There's no way Bakemonogatari is at no.4 while Naruto is 33rd-most overrated. Bakemonogatari is one of the best out there. All anime fans are fat, perverted, 30some years old virgins living in their parents' basement!!!!!!!!!!! There's nothing I hate MORE than an immature anime fan! You people make me sick! Get the #%$# out of your parents' basement and go outside already. Read a book, make friends, KISS A REAL GIRL for Christsake!!! Stop fantasizing about make believe, top heavy, super-powered, alien, robotic, samurai, teenage girls!!!!!!! They don't exist!!! They will NEVER exist!!! And if they DID exist .... they wouldn't be caught dead with a loser like you!!!!! Your biased, bigited remark is unseemly and un warranted except to prove how big a troll you are. I know a lot of people who watch anime and some are my friends teenage kids. Some are adults, married with families, and some are mature adults who actually watch it and enjoy it. Just because your narrow minded momma boy's stupidty keeps you in the dark don't assume everyone who can watch another culture's entertainment doesn't mean they have "issues" as you put it. Just an FYI, something from my highschool days and knowing moron's like you. Come out of the closet you'll feel better about your self and maybe get some help for your perversion. Wow, did you really mean "come out of the closet"? Cuz you were right on until you went there. And now you're just as low and ignorant as NekoMan. are you joking? anime is so much better than most American nonsense shows. maybe you haven't watched the right ones? and believe me I am nothing you described. de surname uzakumi of naruto uzakumi is de same surname as for 1st hokage`s wife i.e; mito uzakumi n also his mother i mean naruto`s mother is sole survivor for her clan .. sooo he might b a distant relative i tink . aditya +7Was this answer helpful? Hmm, I am married(To a very hot women). I am college educated. I have a fairly good job. I moved out of my parents at 15. I live in a half million dollar home(bought after the collapse). I run 15 miles a week, and play basketball 3-4 hours a week. I snowboard all the time, and wakeboard in the summer. I camp almost every weekend in the summer. All and all, I think I am well rounded. I will admit that I just am not into watching sports on TV. And I have to say that "Avatar the Last Airbender" is one of my favorite all time shows. (though not real anime). I also like many anime shows/movies. I am going to dress up in a steam punk outfit for our local comic con. I decorated my pool table room in an anime/comic book theme. But you are a troll, not sure why I am feeding you. A. Have my own house, thanks, though I appreciate your concern about my living situation. B. While I am in my 30s, I don't believe I'm fat. C. "Immature" = look up the definition and re-read your troll post. D. While the idea of making out with an anime girl is somewhat... amusing, I prefer making out with my husband and just being a woman who watches anime. 🙂 Now, go back to your bridge; the goats miss you, dear little fellow. really...dude u have some serious issues....ever considered thearpy? *cough cough* NEKOman. I enjoy watching anime (and drawing it too), am female, and am only 14. I love going out and socializing with both anime fans and non-watchers alike. Who are you anyway? A Teenage Justin Bieber fan? Oops, left out Noir – another of the best animes series. Listen, I liked cartoons as much as the next guy when I was 8 or 10 years old, but the obsession that some adutls have with anime goes way beyond adult immaturity. It borders on developmental disability and an inability to relate to the real world, real people, and real problems in ones' own life. They are cartoons, people! Not real life. Take a walk, read a book, enjoy your loved ones' company, but for goodness' sake! Pretending to have an emotional connection with others over a passion for a partular style of animated stories and characters is just plain crazy. Just my opinion. Why limit it to fans of Anime? I can think of a number of obsessions that are similarly troublesome. People get obsessed about work, literature, TV shows, certain types of exercise. Emotionally someone hooked on anime is not necessarily less healthy that someone obsessed with cycling or their career; they just have a different outlet. Balance is a good thing, I agree, but lets not judge people just based on their particular obsession (at least assuming it is not morally or legally objectionable). Agreed – perhaps my judgment was too harsh. I'm not against being an aficionado of Anime; or cycling, hiking, or romantic movies or stamp collecting or anything else for that matter that's not harmful. It's good for people to have harmless outlets of expression and to form clubs to express a common interest. When I was a kid (ok... teenager, 15) was the first time I ever got into any sort of anime. I was completely hooked on the first season of Digimon! I would actually wake up early on Saturdays to watch it (never after the first season though... got real bad real fast). Some of the movies were cool, like Vampire Hunter D, and Princess Mononoke, but I can't really get into the genre as a whole. Well some fan I am. I didn't even know about the 3 films coming out until you posted that comment. I suppose I had just given up hope! Thanks for your comment! I couldn't agree with you more. Berserk is truly special. One piece of completely unsolicited advice: It's much easier to understand (and perhaps even accept) the anime ending and the events leading up to it if you read the first 14 volumes of the manga. Definitely worth the time and money. I've been wanting to give the manga series a try. So I appreciate the advice in that it may help me accept the ending. Understanding it though was never my issue. I just didn't really like certain elements involved with the ending (don't want to spoil anything for those that haven't seen it). I used to love anime, but things like Bleach/Naruto have nearly ruined it for me. Please help. I totally agree. I sort through them on Netflix, and read the description. It's always something like "Sosuke is a normal high school teenager. BUT THEN HE DISCOVERS HE IS THE ANCIENT DEMON KING AND MUST DEFEND THE SCHOOL FROM UNDEAD DINOSAURS!!!!" Probably my least favorite anime plot device. That, and giant robots. Although Casshern did robots pretty well.. but they weren't Mechs.. it was a whole different kind of robots. Damn it! Why is my “post 1” not appearing where I was begging for suggestions? I’m open if anyone has some. I love GitS, both Vampire Hunter films, Gantz is… umm… interesting. I love Miyazaki films. High School of the Dead, but pretty much only for the fan service and zombie smashing. Mecha is good as long as it doesn’t suffer from “It can only be piloted by this teenage boy who is afraid of cute girls and is otherwise spineless” cliché. I just want something more mature and cerebral (like GitS), or something I can at least laugh at (like High School o/t Dead). I’m sick of the pop anime formula described in my Part 2 post. Buck – I have the box set, and thought it was meh. Any series in which a human body holds 72 gallons of blood, 67 of which are released in five seconds upon any being wounded, is not a series I can get into or take seriously. biggest issue i have with anime anymore is its next to impossible to find in stores. its starting to get to the point they are stop carrying them which means you almost have to purchase them from amazon. which i try and avoid with all costs. hate shopping online. I'm very much a new anime fan (my daughter has gotten into it and I've been along for the ride). I've liked Clannad and the Afterstory, SoulEater, Rosario+Vampire, Angel Beats (terrible ending!! ), DNAngel. I'm not sure what "overrated" implies though. You can't really dictate what people do and do not like. There will always be fans and haters for every show. Black Blood Brothers was seriously annoying because it ended so badly. Overall, I like anime so far, but I'm pretty sure I'll never be in depth about it. It either appeals to me or it doesn't, I don't analyze it too heavily. Clannad is awesome! You might also check out "Here and There, Then and Now." It's a 13 episode series. Good story, with fantastic characters. The best anime in my opinion is still Saved By the Bell. Every else is just fan service for insecure man-boys. I took a look at your channel and it looks like all theAMVs you've done are all sedslihows. No wonder you don't think making an AMV takes attention to detail. As you can see from my channel, I've made sedslihows and moving picture AMVs/GMVs. I can tell you from personal experience that when you work with moving pictures, it does require attention to detail and it can take anywhere from 30 minutes to over 24 hours in total to make an AMV. Depends on how much effort you put into it. One of the main causes of being 'overrated' is, in my opinion, extreme fan reaction, which actually doesn't have anything to do with how good or bad the shows are. When you get a 30 minute lecture on the meaning of the smallest detail in Evangelion or Lost when you mention those shows, it tends to be a turn off. As well, people can end up with such a high expectation for something based on reaction that when they actually get to watch it, the shows can not live up to the hype. Actually I don't think Naruto belongs on a list of the most OVERrated... it's right where it belongs; the most popular. The only reason it's on the list is because so many people disliked some of the story's twists and turns. Most other Animes don't even compete with it storyline wise and it's kept the same standard up (if you don't count fillers) for the entire series. Very well developed character in the story. Now for the most overrated I'd have to say Fooly Cooly.... it's the Anime equivalent of the painting of a Red dot. I've mentioned to other Anime fans that it's junk and I get told that I don't 'GET' it. No I do get it... it's some Manga writer's attempt to be 'deep' and 'thought provoking' so he can get money. The getting money part worked but in my personal opinion it's idiotic and pointless. You aren't supposed to get FLCL...it just is...that is the provoking part. And Naruto is honestly just the new DBZ. Both just kinda keep going with no end in sight. I would say Bleach was similar, but that is finally coming to a close. My Top 5 would have to be: Vampire Hunter D, Ghost Hound, Last Exile, Moribito: Guardian of the Spirit, and Hellsing. There are a bunch of overrated anime aka Naruto, Bleach, and of course the dreaded Dragon Ball Z.
Whew for a minute, I thought you were saying your top 5 were the top 5 overrated–I loved all of those series you listed. Another great would be Dennou Coil (even though it's a little more kid oriented). I agree with this 100%. Good list. Though it was a very long series and I haven't seen all of them Ranma1/2 was the anime that got me interested in the medium. Like another poster said I'm a part-time anime fan. Great characters, situations rivals just a great show. Death Note is my absolute favorite. My ex-boyfriend and I used to have some pretty deep discussions about it. I also watched a little bit of Durarara last weekend, and it was fantastic! I was always a fan of Yu-Gi-Oh! (not really GX and definitely not 5Ds), of course Pokemon, and Digimon (the REAL Digimon, not this season 5 crap)... Very big part of my childhood. I don't like ANY anime at all. Give me good old American 2-D any day. i used to feel the same way. until i saw some real anime (Vampire Hunter D), and was impressed. now, i'm a "part-time" fan. don't love it all, but there are definitely jewels. check out Death Note. I agree, check out Death Note! Greatest thing I have ever seen on television (or paper). It is very psychological and deep. I really have to wonder what made you want to even view this article then? Except that the vast majority of American animation is done in Korea. We only write it. If I may offer an opinion of someone who's older by two decades than most anime fans. Just because something is popular doesn't necessarily make it overrated. I believe Bebop was an incredible anime for the era it was released in the US. The soundtrack alone blew my mind. I believe anime is just like any art form. You may not know what is 'good' but you know what you like. To encourage enmity between fans is, quite frankly, a waste of time. While I agree with what you said (and love Bebop as well). In today's world just saying you like something will propel some to cast it downward. I too am an older anime fan (56) and actually turned my nose up at them maybe just because of the strong opinions (whether one was called for or not) flying around so maybe some should think before they open their mouths to criticize as all words affect others. But maybe that's the point. For me, I enjoyed Ghost in the shell, Black Butler, the samuel jackson voiced one and many many more but I would never presume to consider myself an authority on anime's. I'm also an old school anime fan (I remember when they butchered Gatchaman and Space Battleship Yamato for US television) and I'll agree that there is a ton of crap anime out there. I love the genre, but so much of it is really trash. For every throught provoking series like Full Metal Alchemist (on of my favs of the past few years), you get a ton of badly drawn garbage. Can anyone justify One Peice to me? I felt my IQ dropping as I sat through the opening credits. I like Bleach, but there are just too many pointless filler episodes that do absolutely nothing to move the plot along. Why do I have to sit through fifteen episodes of battles for the Soul Reapers before we get back to the focus of that season's story arc? I'll happily sit through endless showings of the Ghost in the Shell movies as well as the television series, and I adore Miyazaki films. But a lot of the rest is just mind-numbing drivel. I've always thought that the best animes were Last Exile, Gankutsuo (Count of Monte Cristo), Noein, Mushi-Shi, & Ergo Proxy for series. And for movies, i like Wonderful Days, Metropolis, Final Fantasy (Spirits Within), 9 & Kaena the Prophecy (although one could certainly say the the last three are not true anime). Most overrated would be Akira, Cowboy Bebop, Ghost in the Shell, Death Note etc. I LOVED Madoka Magica, K-On! and Angel Beats. As far as the one I enjoyed the most out of the three, K-On! gets the award. The slice of life anime always left me with a silly grin at the end of each episode. Madoka Magica gets the award for most memorable and shocking and most intriguing plot. Angel Beats was very good and far better than average but not my favorite. My personal favorites are Mushi-Shi, Casshern Sins, Clannad: After Story, and Spirited away. I like heavy drama.. I've never been much into the giant robots. Those, to me, are the overrated ones. And the martial arts ones.. especially Dragon Ball and Bleach.. where one fight takes 13 episodes of "powering up." Though I must say, I did get pretty into the Bleach Video games on Nintendo DS.. I liked the Characters, but the episode progression was so slow! In my opinion the greatest piece of Anime ever created was Ghost in the Shell ( 攻殻機動隊 Kōkaku Kidōtai or "Mobile Armored Riot Police"). Written by the amazing Masamune Shirow. This work is perhaps more influential than any other for bringing true Anime to the US and Europe. certainly one of the most intelligent and sophisticated to be released in the US, but i think it started with akira, the reception wasant a huge one but it did make waves with the underground fans.... and over the years grew, then came gits... companys wanted to capitalize on the fact that they could make anime releases popular considering that there was a growing interest in anime during the mid 90's. This is a really good article.....but I'd like to point out that is not Mami in the picture. That Would be Homura on Madoka's left.